I've recently been meditating on the metaphor God gave us of being lights to the world. We understand that we've been called to be a light to the world, but what kind of light exactly? What started this thinking process most recently is the increasing amount of Christians that I see who are so quick and eager to correct others for doing wrong (myself sometimes included in that!). While I know it happens a lot outside of the internet, I think social media has made it that much easier for us to express our thoughts and opinions freely. We feel comfortable hiding behind a computer screen when we attack someone else for doing or saying something that we don't particularly agree with. But is this how Christians should act? Is this aggressive, sometimes violent, portrayal of faith an accurate representation of who Christ is? What kind of light is that? There are a multitude of different kinds of light. There are flashlights, headlights, lamps, candles, lights for the garage, lights for the closet, chandeliers, sunlight, moonlight, the list goes on! All have the same purpose: to help you see things better. But what happens when one of those lights is used incorrectly? Let's take the flashlight, for example, because I think it's one of the closest things we have to the kind of light God wants us to be. When a flashlight is used correctly, it helps you find your way at night or it can help you see into places that are really dark. You point the light in the direction of the path or the thing that you want to illuminate. If you and a friend are walking together, you can both see the path clearly when the light is pointed in the right direction. However, if you take that light and you shine it in your friend's eyes, they can't see the path and neither can you because you're shining it at your friend and not at the path! God calls His word a "lamp" to our feet. My thinking is this--if you are supposed to be a light, your light should shine just enough to help others walk the path. It's a quiet kind of light. The very fact that you follow the Lord and are eager to walk in his ways is enough. 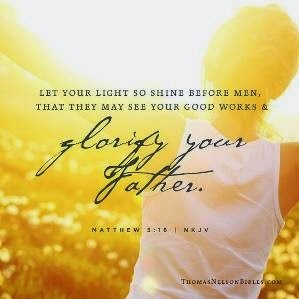 His light shines through you--your LIFE becomes the flashlight. When you get overzealous and too eager to be in each other's faces about who is right and who is wrong, neither of you is walking the path. You're just blinding each other. The same is true if you're too busy boasting about how great of a Christian you are or acting "holier than thou". Your light is pointing at you and not at the path. Being God's light requires humility. It's a gentle, kind, and beautiful kind of light. It's friendly and welcoming and beckons others to walk in it. While I know it's a growing process that's going to take a lot of time and effort to achieve, that's the kind of light--the kind of Christian, I want to be. Home Wisdom: Vinegar in the Dishwasher! Left glass is before vinegar--Right is after! Many people, I'm sure, already know this, but for those that don't, I wanted to share this bit of knowledge I learned today. Jon and I recently switched our dishwasher soap to this awesome toxin free soap from The Honest Company﻿! It was great the first month we used it! Then I started noticing this gross white film on all of our dishes. We kept running the dishwasher because we thought the dishes weren't clean... I finally had enough of it and started doing some researching. Turns out, that awesome toxin free stuff can create mineral build up in the dishwasher because it's not using those harsh cleaning agents that are in most common dish soaps! A little inconvenient, but there's an easy fix... Just add in some white vinegar to the dishwasher after the soap dispenser releases the soap and Voila! Clean dishes! :-) You can also run a vinegar cycle on your empty dishwasher to help clean up any extra build up you may have in there. It's been awhile since I've posted on my blog, mostly because I haven't really been cooking much or really doing much worth posting ;-) However, I started to think that maybe the little things I HAVE been doing would be good to share. Something I realized as I started writing was that I have many more questions than I do just random thoughts. My innermost doubts and fears surround things like, "Am I going to be safe?" or "Does God love me even when it feels like no one else does?" I've found such freedom in letting my fears and worries come out of my head and down onto paper. It's like I can examine each thought and process it more fully and the best part is that I can pray over it and open my Bible to look for answers to my questions. 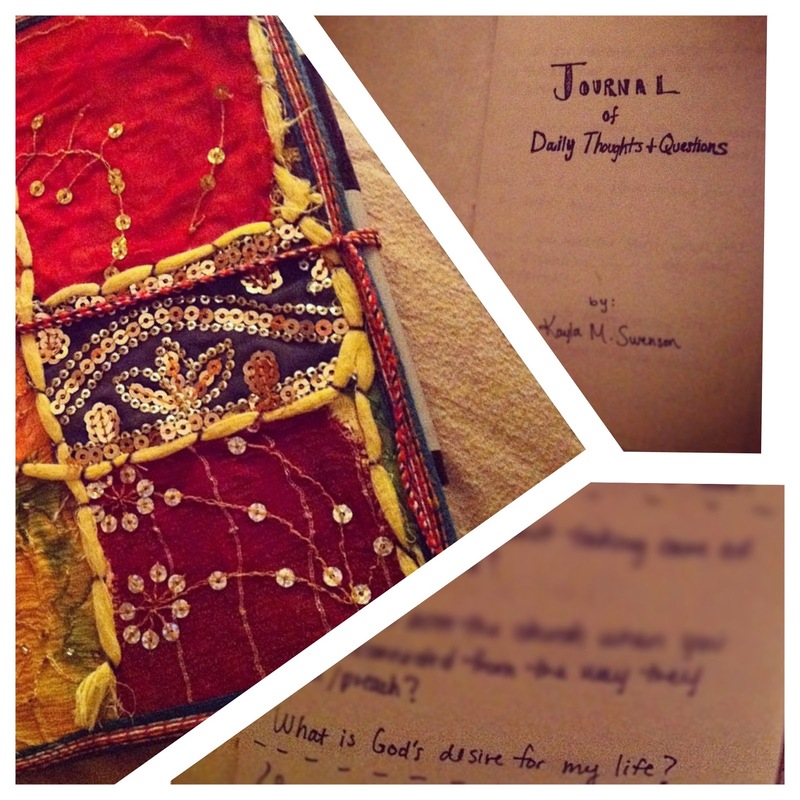 If you're struggling with wild thoughts like I have been, take time to write them down. Get them out of your head so you can release them from your mind and take your thoughts to God so he can give you peace. I'll be praying for anyone who reads this today. Right before going in the oven! 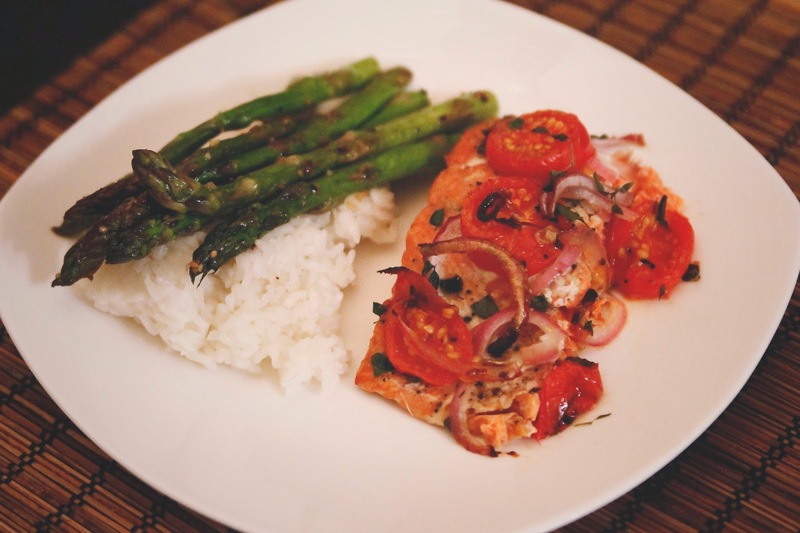 Served up with pan-seared asparagus and jasmine rice! Preheat oven to 400°. Grease a 9X13 casserole dish with 1 TBSP of the olive oil. Lay the salmon down in the dish, skin side down. Top the salmon with the minced garlic and use a spoon to spread it over top. 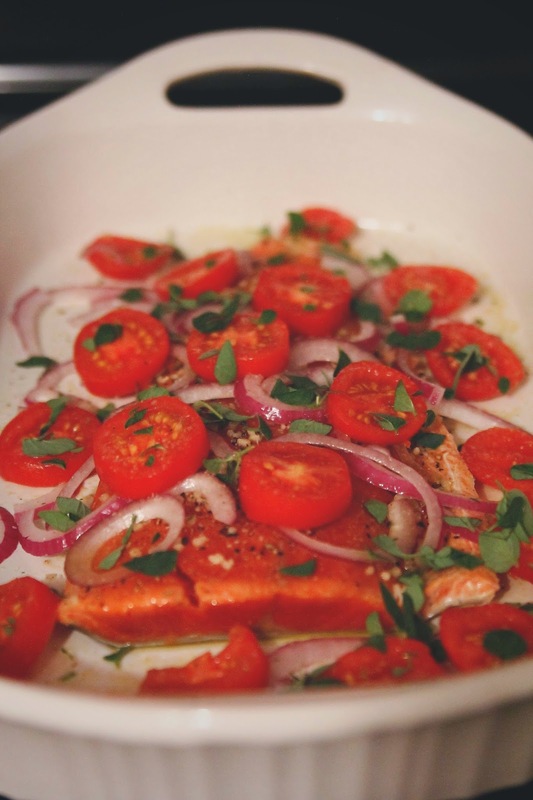 Then place the onions and tomatoes across the salmon and garnish with fresh oregano. Drizzle the remaining olive oil across the top and sprinkle with salt and pepper to your liking. Place in lower rack of oven and cook uncovered for about 25 to 30 minutes. Remove from oven and let cool for 5 minutes before serving. Serve with rice and your favorite veggie and enjoy! The passing of a loved one is probably the hardest thing that we, as humans, are forced to deal with in our lifetimes. 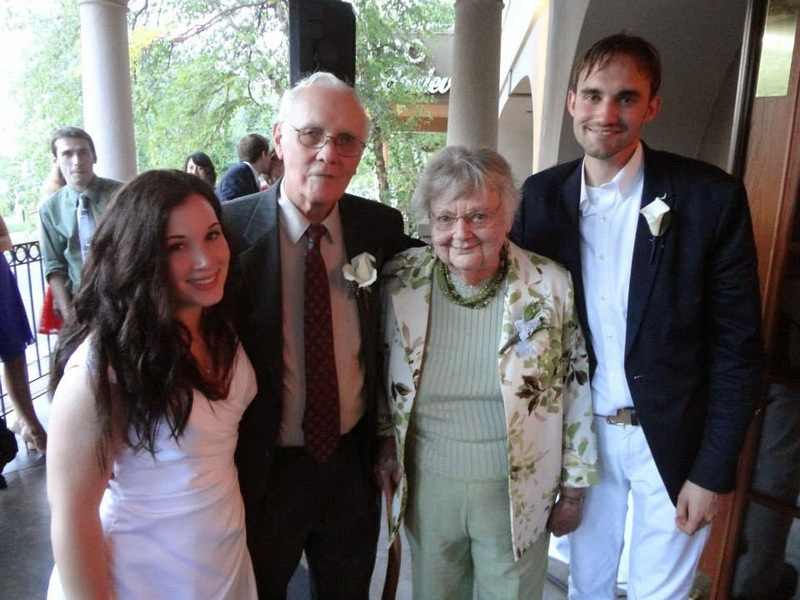 Today is a day that I'm reminded of a special, one of a kind woman who would have been celebrating her 86th birthday. 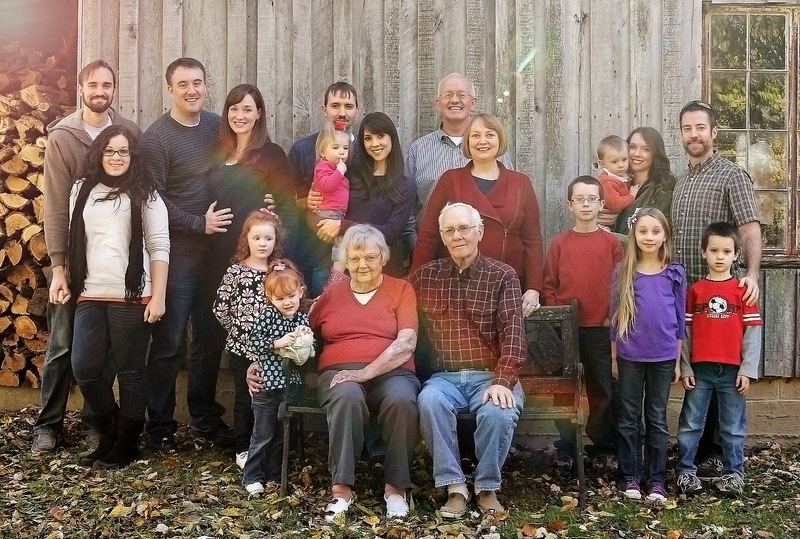 Jon's grandmother, Sarah, (or "Mamaw", as she was affectionately known) passed away just a few short months ago... I can't help but think of her today and what a wonderful a woman she was. I remember meeting her and feeling her warmth almost immediately. She had an air about her that was so friendly and yet so feisty at the same time. Mamaw was outspoken and I felt a kindred spirit to her that way. She always said it like it was and Jon and I felt the affects of that after we'd been dating for several years. Whenever we'd see her, she'd ask if we were going to get married anytime soon... ;-) When we finally tied the knot, we somehow ended up seeing all of Jon's family the very next day--including Mamaw. I remember Mamaw putting her arm around Jon and acting a little sheepish as she smiled and said, "Well... Did ya get lucky??" She was never afraid to be bold. She was never afraid to be humorous. I don't know a single person who didn't feel unconditionally loved by her... I feel so blessed that I was able to know her, love her, and be loved by her over the past five years and I feel blessed immeasurably by the legacy of love she left behind. I think all of her children and grandchildren (and all of their spouses) would agree that she is someone we all look up to, admire, and want to be like. So today I celebrate the legacy of a wonderful woman, whom my husband and I miss so dearly. Happy Birthday, Mamaw. We love you. The last family picture we all took together.. How I cherish this now. "Her children arise and call her blessed; her husband also, and he praises her: 'Many women do noble things, but you surpass them all.' Charm is deceptive, and beauty is fleeting; but a woman who fears the Lord is to be praised. Honor her for all that her hands have done, and let her works bring her praise at the city gate." I tried out this recipe on a whim one day and it's quickly become one of my favorite sweet breads to make. The thing I love most about baking bread is the opportunity afterward to share it. There is something about bread that just seems to bring people together. It has such a uniting quality. I think that's why restaurants typically serve bread right before a meal out. It's like an opportunity to break the ice, to start a conversation, to have an experience with someone else that is the same. Whenever I make bread, I'm reminded that Jesus is the bread of life. He came to unite us while Satan aims to divide us. Jesus shares the bread of his life so that we may partake in a similar experience with him in the Kingdom of Heaven. I want so desperately to choose the bread of life. So, whenever I make bread, I try to share it. I try to connect with other people in hopes that maybe my gift of bread will help break down barriers and that we can share in the joy of life together. 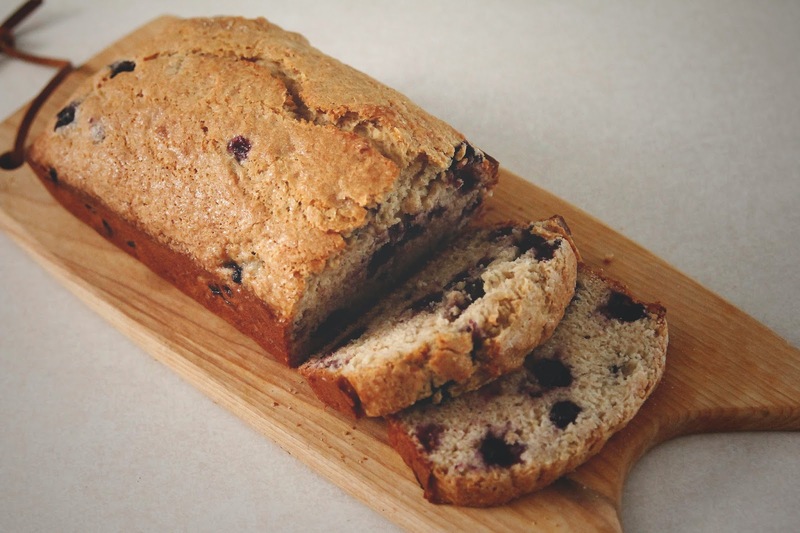 Blueberry Banana Bread, fresh out of the oven! Preheat oven to 350°. Grease a 9x5 loaf pan. In a small mixing bowl, combine flour, baking powder, cinnamon, nutmeg, and salt. Set aside. In a separate mixing bowl, combine the coconut oil, sugar, 1 egg, vanilla extract, and mashed bananas. Once the ingredients are combined smoothly, slowly add in the flour mixture just a little bit at a time and stirring as you go. Using a hand mixer, combine until smooth. Then, fold in the blueberries with a large spoon or spatula. Add the batter into your greased loaf pan, shake until it spreads evenly across the bottom of the pan, and then sprinkle the remaining raw sugar onto the top of the loaf. Bake for 60 minutes. Remove from oven and let cool for 10 minutes. Then remove from the loaf pan and allow to cool on a cooling rack for 5 minutes before serving.